Thank you for visiting Hedge Fund Grannies. The novel is available on Amazon.com in print and E-reader versions. Also available on Kindle Direct. The bankers and financiers of Wall Street meet the middle class living on Main Street in this satire about the latest investment craze. Pierre Beauty Products discovers a powerful cleansing chemical in crabgrass growing on the lawns of a commuting town outside New York City. It could be the missing ingredient for an all-natural shampoo and potential billions of sales for Pierre. A Chicago commodity house quickly realizes there is enormous potential value in the plants and tries to wrest control over pricing and supply from Pierre. New York’s Wall Street bankers raise capital and form new investment vehicles around the newest financial discovery. Homes in town suddenly regain their value, and residents finally have a chance to recover their losses from the last real estate and stock market collapse. Will this sudden boom last? Have people learned their lesson about managing their financial affairs after the latest crash? Learn all about the latest in high finance. An investment bank attempts to corner the commodity market. A hedge fund stages a bear raid using credit default swaps. There is a dab of computer trading and ETFs, a taste of a reverse merger, and even a smidgen of insider trading. Bobbing and weaving throughout the story is Averill, a penny stockbroker who just doesn’t know how to make an honest buck. Watch the story unfold from the tables at Ben’s Deli, where local business owners, politicians and commuters stop for breakfast and a little gossip before their workdays begin. They get a front row seat to all the action as the cable news crews and social media begin their round-the-clock coverage of this latest darling investment of Wall Street. Herlihy, a former investment banker and CFO, brings his extensive knowledge of Wall Street and sense of humor to Hedge Fund Grannies. I wrote the novel to give readers an entertaining way to understand the highly volatile behavior of today’s markets. Why does your mutual fund jump up and down two percent a day? Can the big financial meltdown from 2008 recur? We have experienced an unprecedented increase in volatility in today’s markets. We have also witnessed several market crashes, the latest which almost caused a worldwide financial catastrophe in 2008-2009. The key elements that led to these booms and busts still exist, and the tools that allow financial giants to make enormous profits from crashes are getting faster while becoming less transparent. It doesn’t even take malicious intent; everyone is just trying to make a living. However, the next time could be even more catastrophic. It could be the last crash. HFG provides a behind-the-scenes look at how Wall Street works. What do investment bankers, stock, bond and commodity traders, hedge funds, research firms, and stockbrokers do for a living? Who causes the extreme volatility and rapidly changing asset prices in today’s markets? Is it high-speed computer traders using ETFs and complex derivatives to buy and sell investments with lightning speed? Is it small day traders rapidly entering and exiting positions? Or is it institutional investors like pension funds and not for profit foundations and universities who have begun to speculate in non-traditional asset classes? 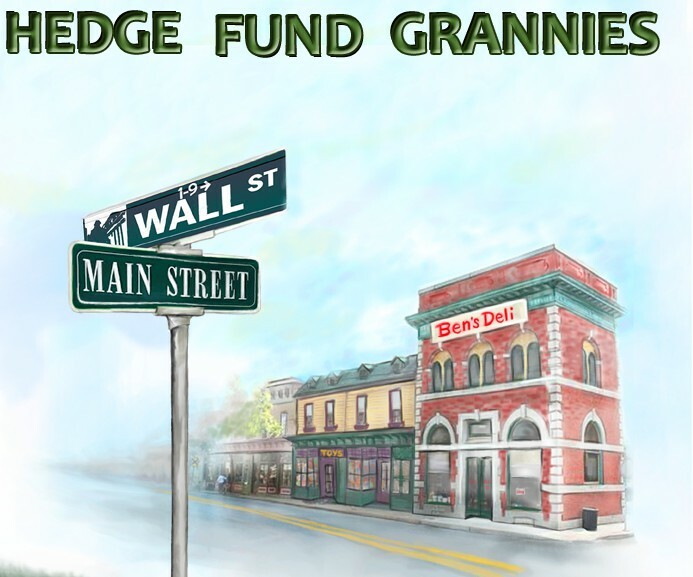 This entry was posted in HFG Updates and tagged HedgeFundGrannies on May 1, 2013 by Tom Stitt.